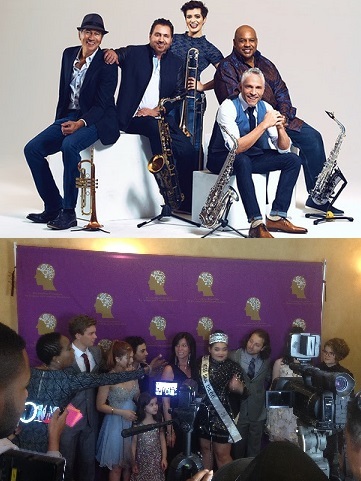 "We are all friends," said Grammy nominated saxophonist Dave Koz about his guests on the "Summer Horns II: From A to Z" project out June 22, 2018. "Like anything collaborations are more successful when they are rooted in real friends. We had a great time." The "Summer Horns II: From A to Z" (Concord Records) album's guests include Rick Braun on trumpet (also co-producer), Gerald Albright on alto sax, Richard Elliott on tenor sax, and Aubrey Logan on trombone (and vocals). Other featured vocalists include Jonathan Butler, Kenny Lattimore and Shelea. The project is also co-produced by Tom Scott (Aretha Franklin), Greg Adam (Santana) and Grammy winning Gordon Goodwin. "We put our careers to the side for this project. We wanted to make it great, bigger than any one of us individually," Dave said about partnering with Braun, Albright, Elliott and Logan. On the first "Summer Horns" Grammy nominated project Logan couldn't make it but on this one she brings her trombone skills. "Rick and Aubrey came on board adding brass and trumpet making it a lot more powerful." Koz added. "The first album focused on a certain era. This is much more across the board like Duke Ellington's ‘A Train' combined with Jay Z's song ‘A to Z and Everything in Between.' We decided to do a remake of a Gloria Estefan song ‘Congo'. Gloria is a friend. I decided to send it to her to get her blessing. She said not only do you get my blessing I want to sing on it. Aubrey worships Gloria and to have her singing background!" In Hollywood celebrity kids are supporting other kids that have learning disorders by supporting The Jonathan Foundation's fundraising events. I attended the 2018 The Jonathan Foundation's "Spring Fundraiser" to cover the red carpet arrivals where young actors came to bring people to the auction that had special celebrity memorabilia. "We advocate for children. We meet with the parents and we help them identify what's happening with their children," said Raja Marhaba founder of The Jonathan Foundation. "We put a plan together and talk with the school district and try to get services for them." Actor Michael Campion, who plays Jackson on the Netflix series "Fuller House," was there to support the event. He talked about his role in the spin off to the series "Full House." "I actually just heard of it...but then I read through it and it's just really amazing what they can do," Michael said. "I love coming to these kinds of events." Taja's son Jonathan, whom the foundation was named after, suffered from a learning disorder as a child which sparked the passion for the launch of this organization. That passion is seen clearly in both him and his mother. "We work with an organization to help get girls off the street," said Jonathan. "Their acting out because they need attention. We have to figure out what's going on and introduce something positive in their lives...what they need around them so they can grow." Young actor Hunter Payton, most known for his break-out role on NBC's "A to Z" was there to support the fundraiser. "'A to Z' that was amazing," Hunter recalled about the NBC show where he played Young Andrew. "It was the first big TV series I was on and all the people on the show today are like my best friends. From the show I think I got more confidence and a lot more exposure." SYNDICATED COLUMN: Eunice Moseley, has an estimated weekly readership of over ¼ million with The Pulse of Entertainment. She is also a Public Relations Strategist and Business Management Consultant at Freelance Associates, and is Promotions Director (at-large) for The Baltimore Times. www.ThePulseofEntertainment.com. EVENT: 19th annual "Uplifting Minds II" Free Entertainment Conference (Baltimore on Sat April 21st 1 - 4p, at Security Square Mall and Los Angeles on Sat October 20th 1 - 4pm at the Celebrity Centre in Hollywood). Entertainment Business panel and national talent showcase competition (vocal, songwriting, dance and acting) with over $15,000 in prizes. www.UpliftingMinds2.com.